Jewish lawyers call to strip an Arab lawyers’ group of UN recognition after it praises bomber who murdered 21 Israelis. The International Association of Jewish Lawyers and Jurists has called on the United Nations to strip an Arab attorneys’ association of recognition following its praise for an Arab suicide bomber who murdered 21 Israelis. The international Arab group honored female terrorist Hanadi Jaradat, a 29-year-old attorney from Jenin. 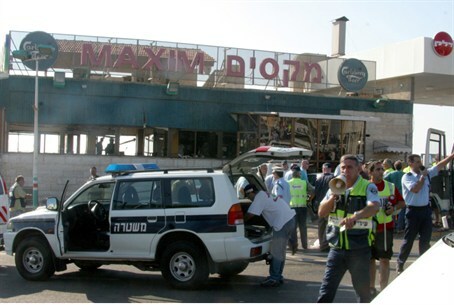 Jaradat carried out the suicide bombing of the Maxim restaurant in Haifa in October 2003. Jaradat murdered 21 people, among them several young children. The attack received much public attention for being unusually horrific even in a year in which terrorism was frequent. Two families lost members of three generations: Bruria Zer-Aviv, 59, was killed alongside her son Bezalel and his wife Keren and the couple’s two young children, Liran, 4, and Noya, 1. In the Almog family, grandparents Zev and Ruth, father Moshe, and son Tomer were killed, as was a second grandchild, Asaf Seier. Tomer’s twin Oren, then 9, was badly wounded and blinded in the attack; he is currently volunteering for the IDF despite his disability. Kol Yisrael radio reported that International Association of Jewish Lawyers head Irit Kohn has written a letter to United Nations chief Ban Ki-Moon expressing shock at the fact that the Arab attorneys’ group, which represents 15 countries and claims to stand for human rights, decided to honor a person who carried out a crime worthy of condemnation.